How were you first introduced to reborns? Since I was a little girl I have loved babies. I love looking at them and holding them. I saw a reborn baby at a market one day and was totally fascinated with it. I decided that I wanted to find out more about where I can get one for my daughter, who also loves babies. I did a lot of research online and found out that I can actually make my own reborn, this got me really excited and I went on a course to learn the art of making them. What was your experience when interacting with the doll? Was it emotionally very similar to holding a reborn child? In what ways? Are the dolls calming? Reassuring? Reborn babies are amazingly life like, and I think your maternal instinct kicks in immediately when holding it and they do definitely have a calming effect. Are you surprised by how many people are interested in having a reborn? Yes I am, I find that reborns are an endless source of fascination with people and are becoming more and more popular. Can you describe the process of making the dolls: how long does it take, where can you find the supplies? Have you made any innovations to the production, to improve how life-like they are? It typically takes me around 14hrs to make each baby. They are painted with several layers of paint to give depth, detail and realism and baked in an oven. The hair is hand rooted and then the baby is weighted with glass beads. I source my supplies overseas, but there are a few people locally who supply the kits and paints etc as well. I prefer for my reborns to be seen as an art and not as a toy as a lot of skill, experience and passion goes into creating one. In general, who are the people who buy the dolls from you? What motivates them? Older woman, doll collectors mainly, little girls aged 8 and above, and then also woman who don’t have children. I think what motivates woman is nature, when a woman holds a baby it releases a hormone called oxytocin known as “love or cuddle hormone” and so when a woman holds a reborn which looks and feels just like a real baby that same hormone is released, and it is this hormone that makes a woman bond with a baby. Some people consider reborning eccentric. Have you been the recipient of judgmental comments or criticisms? If so: what kind of criticisms? Yes, I have had some funny comments, really people just saying they think it’s weird that a grown up woman can play with a “doll”, and also a fascination about who my clients are. Also a few people think they are creepy or freaky, some saying they look like dead babies, I don’t quite understand that though, to me they look angelic and peaceful just like a real baby does. Do you ever go out with a reborn? If so: what’s the public reaction like? Yes, my daughter takes her reborn out quite a bit, she loves it. We generally have crowds around us asking questions, wanting to hold the baby and asking for business cards. People are just truly fascinated and amazed, a lot of people confusing it as a real baby and asking how old the baby is, some in total disbelief that it is not real. I also get a lot of compliments from people telling me how talented I am. Who do you think makes the most beautiful or incredible reborn dolls? I think there are many great reborn artists out there, me being one of them. 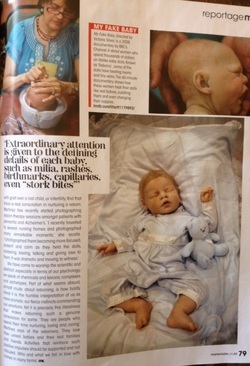 I am particularly inspired by Michelle Fagan, she makes the most beautiful full silicone babies. I imagine there’s a real emotional connection with the dolls. Do you ever feel like you’re abandoning them, say if you go away for holiday without them? Or if you’re busy and don’t spend much time with them? You do tend to make sure the baby is lying comfortably, it’s almost just a natural reaction, perhaps maternal instinct. But my passion is more in the art of making the babies. Again I enjoy making the babies, seeing it start out as just a vinyl kit and watching it transform into a beautiful baby.